College graduates, young professionals, and people making mid-career transitions to other occupations are haunted by the specter of “automation.” “Ten years from now,” the question is often posed, “how many of our jobs will be automated?” People are making decisions about their future careers in the face of this economic uncertainty. 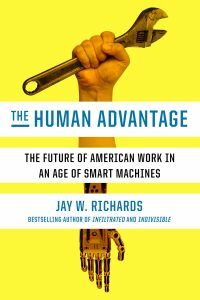 In The Human Advantage: The Future of American Work in an Age of Smart Machines, philosopher Jay W. Richards tackles the many myths that surround automation in America. Previously known for his writing on economics, Richards uses his new book as part contrarian tract and part interaction with other writings on work in twenty-first century America. He offers a substantive set of rebuttals to various economic misconceptions and a cogent synthesis of ideas around topics like Universal Basic Income (UBI). And, as is the case with Richards’s other projects—including Money, Greed, and God, The Hobbit Party, and The Stream daily—readability is one of his primary concerns. Opting for clarity instead of academic turgidity, The Human Advantage will be at home on the bookshelves of average Americans as well as those of people working in technology and policy. This prediction of a robot-baron ruled future, says Richards, ignores both the basic laws of economics and the reality that humans will always be needed in the American economy, however automated and information-rich. The economy grows, and it will continue to be a rising tide that, for the most part, lifts all boats—and humans. This, he claims, is because the human brain’s unique capabilities, which have proved impossible to replicate in our computers, will be afforded new opportunities in the richer, larger economy of the future. Critics of laissez faire capitalism will be sure to pounce on this point, claiming that to leave the economic fate of millions to the market is an unquestionable evil masquerading as a free-market solution. Many of these same critics will call for the adoption of UBI to mitigate the social impact of the coming mass of jobless Americans. Yet in Richards’s analysis, an economic Moore’s Law of exponential growth is evident in today’s vastly enriched world. He makes the historical observation that at “every financial crisis and economic inflection point, false prophets offer up old myths, insist that the truths of economics no longer hold, and issue calls to upend the system.” He finds these factors cause for doubting similar apocalyptic prognoses for America’s economic future. As he draws to his conclusion, Richards quotes economist Deidre McCloskey deriding this kind of “pessimism” as a “consistently […] poor guide to the modern economic world.” Indeed, Schumpeter’s notion of “creative destruction”—the market’s tendency to replace old occupations and products with new ones—has long been identified as an engine of growth in the long run. At the heart of the horrible forecasts for humanity in an age of automation is a dangerous propensity to identify the past as a Golden Age. Richards is right to note this mistake in economic thinking. Idealization of the past is pervasive in modern America, and he points to examples in the liberal tendency to “invoke a post-World War II workingman’s paradise” and in the conservative inclination to call us back to an era when “GIs and college grads cold easily afford to buy a house in their twenties, nab a middle-class job, keep it for forty years, and retire to Florida.” These examples certainly do not encompass all liberals and conservatives and may strike some readers as cartoonish representations of American politics. But to hang oneself up on rhetorical flourishes is to miss Richards’s point: both parties in American politics are guilty of contrasting contemporary problems with idealized visions of the past. A study of history and politics reveals a human tendency to appeal to the past as a Golden Age, and not just in the realm of economics. Economic, social, and political challenges, as they begin to emerge in society, can feel overwhelming and often call out cadres of pundits who proclaim that a particular sky is falling. The sky, however, has yet to fall—and Richards’s new book suggests that it is unlikely to start falling even in an America in which automation is more central to the economy. Jacob Bruggeman is an honors student in his third year at Miami University with majors in history and political science, and a combined BA–MA program in political science. Jacob was recently honored for his research as one of fifteen national recipients of the Gilder Lehrman History Scholar award, and is one of two Joanna Jackson Goldman Scholars at Miami. In 2017, Jacob founded The New Herald, a journal of cultural and political commentary.